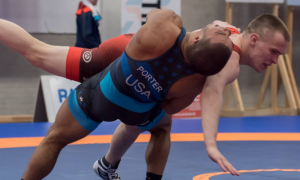 Earlier today, 2016 Olympian Robby Smith (130 kg, NYAC/Chicago RTC) powered his way to bronze following a 3-1 performance at the 2019 Kristjan Palusalu Memorial in Tallinn, Estonia. 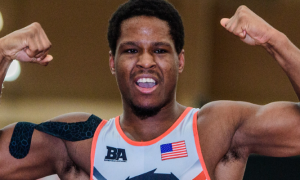 The medal, which is Smith’s 21st on the Senior international level, came on a day that saw two other US athletes compete — Chris Rodgers (67 kg) and Nick Tarpley (72 kg, NYAC). Rodgers was returning to action on the heels of a lengthy hiatus, and finished 0-3. Tarpley, who has vastly improved the past two seasons and came in fifth at Thor Masters last month, only had one match on Saturday, a tough 9-6 loss to Finland’s Toni Ojala. Smith started off his day with a resounding tech win over Volodymyr Teslenko (UKR), which advanced him in the pool. The next round offered a stiff test in the form of three-time Junior /2018 U23 World Champion Zviadi Pataridze (GEO). An early sequence saw Smith baiting Pataridze before attempting a throw; unfortunately for the American, he was unable to convert and Pataridze landed on top, receiving four. 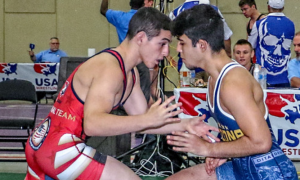 In the second period and despite Smith exhibiting a heightened pace, Pataridze was the beneficiary of a passive point that served as the final nail in a 5-0 decision loss. But Smith rebounded immediately. He collected a 10-0 tech at the expense of Tomasz Wawrzynczyk (POL) to secure his spot in the bronze round — and then he used an arm throw to put Artur Vititin (EST) in danger just ahead of sealing the victory via fall in the first period. 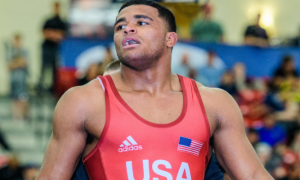 Afterwards, Smith acknowledged that while it was nice to notch another foreign medal, the main point was getting out on the mat against capable international competitors leading up to the World Team Trials. 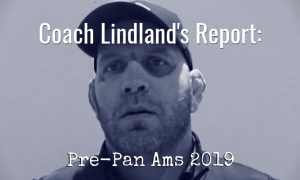 “Although I didn’t win gold, I got four matches in under my belt, and that’s the most important thing right now, match time,” he said Saturday evening. “It would have been nice to get the gold, but having those matches is equally important. I’m happy with just getting the match time that I got and moving forward from this with the Trials coming up in May and the Final X. I am very happy with what I achieved this weekend — but it was also what transpired this week. I trained with (two-time World Champion Heiki) Nabi during the week and then having four matches to top it off is spectacular. 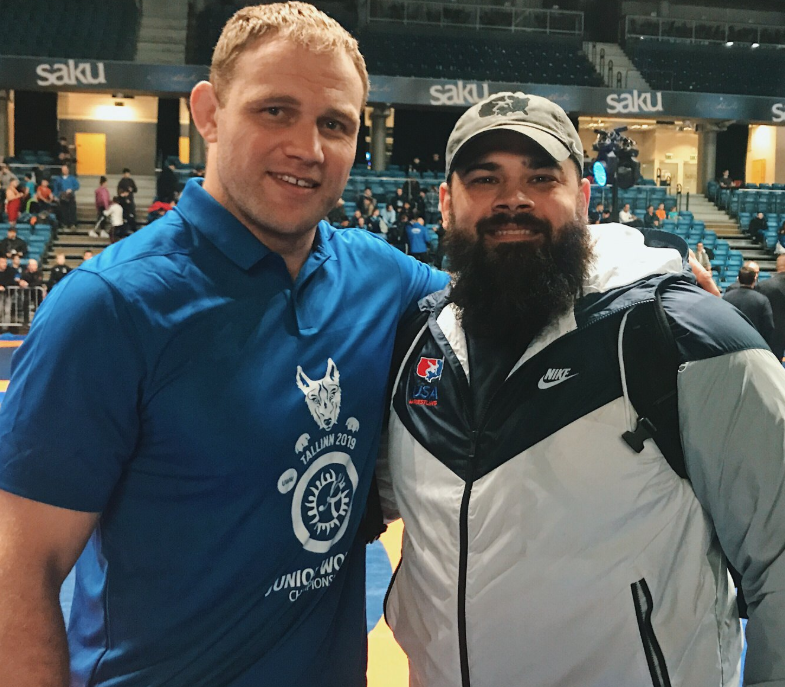 Former National-level Senior Greco athlete Chad Vandiver — whose wife Erin is the head women’s coach at the aforementioned Wyoming Seminary and herself was a World-class wrestler — assumed coaching duties for the Americans on Saturday and provided his overview of the tournament. “Robby had four quality matches today, he had two tech falls and one pin,” Vandiver said. “The one match with the Georgian was one sequence and a lot of pushing. 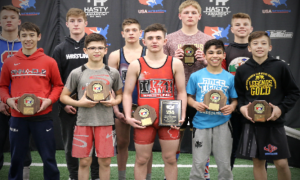 But Robby was a great help to us this week for Wyoming Seminary, we came away with 18 top-six medals and 11 in the top-three, and two Greco medals. It was a great experience. I’m over here trying to provide opportunities like this for Robby and I hope this was a good tune-up for him going into the thick of the season. 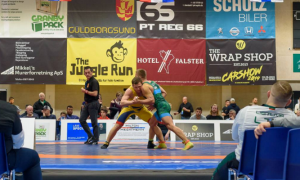 Tarpley also competed at the Kristjan Palusalu in 2017. 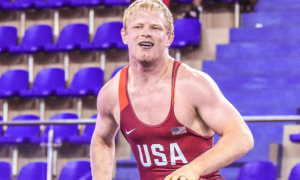 He earned bronze at the tournament while Brandon Mueller (77 kg, Air Force/WCAP) picked up silver. Rodgers is a former Northern Michigan/OTS athlete but has since moved on to train in Colorado Springs.